NEW YORK— Seven months after a devastating explosion leveled two buildings in East Harlem, an open market-square a block away from the gas leak was filled with music, food, and a sense of hope and change. For some, hope comes in the form of a maple syrup grilled cheese sandwich. From Oct. 26–Nov. 23, for five Sundays, La Marqueta on Park Avenue from 115th Street to 116th Street will be home to award-winning food trucks. The festival is an attempt to revitalize the market with the entrepreneurial spirit of the food vendors. Three years ago, Jordyn Lexton was teaching English on Rikers Island. She saw first hand the effects of incarceration on 16-year-olds—treating and sentencing teenagers like adults. New York and North Carolina are the only states that prosecute people as young as 16 years old as adults. The system was horribly broken, Lexton said. And it really restricted the youth in terms of development, and education or employment opportunities after being in jail. Then, during a culinary arts class, she really saw her students thriving. She combined the thought with her own love of eating and started a food truck business, where young people getting out of Rikers have the chance to learn culinary and business skills. She started the nonprofit Drive for Change this spring, and Snowday is the first truck. “We can use the business as a tool to teach initial skills, and being a truck allows us to be out in the community, talking to people, and use the service to really change the way people think of a former Rikers incarcerated person,” Lexton said. Lexton dreamed up the initial menu while in her mother’s kitchen, but her culinary arts directors have since enhanced and improved upon it. Jackson heard about Lexton’s food truck while he was incarcerated on Rikers Island from another inmate, and joined after his release. “I think it’s amazing, that it could give so much opportunity,” Jackson said. In 1936, the market was opened as the Park Avenue Retail Market. Over the next two decades, the neighborhood transformed into Spanish Harlem and it became known as La Marqueta. Vendors sold ethnic foods not found elsewhere to customers from East Harlem, Central Harlem, South Bronx, and the market thrived. Then it started declining around the 1970s. It became a site of nostalgia for the neighborhood, and there had been several attempts to revitalize the space since. This spring the city announced a $3 million renovation. 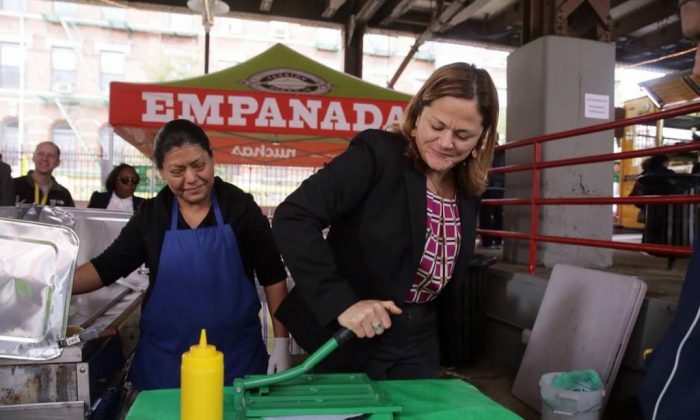 The five-week food truck event is a collaboration among City Council Speaker Melissa Mark-Viverito, the NYC Economic Development Corporation, Urban Justice Center’s Street Vendor Project, and the Vendy Awards. The hope is that the food vendors and trucks will bring people to the space, and maybe some of the vendors will sign leases for indoor space at the market. “They can become beacons of hope and opportunities for communities,” said Kyle Kimball, head of the NYC Economic Development Corporation.